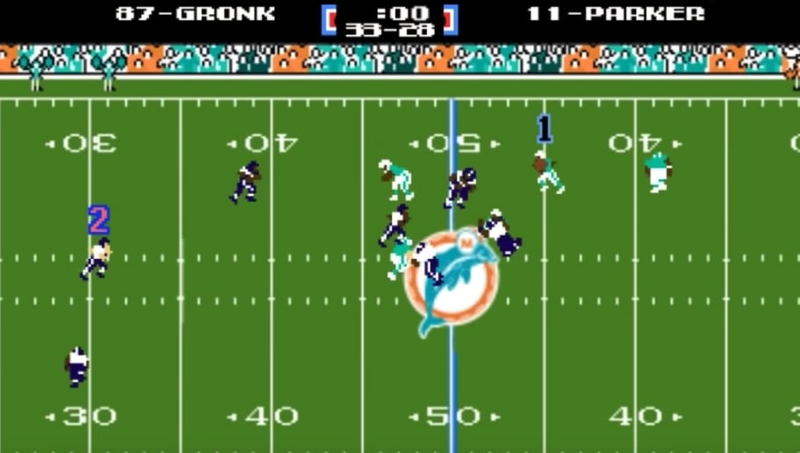 The incredible finish to Sunday's Miami Dolphins-New England Patriots game, which is being dubbed the "Miami Miracle" or "Miracle in Miami", has made its way from the lore of NFL heartbreak and into the 8-bit world of Tecmo Bowl. That's right, fewer than 24 hours after Dolphins RB Kenyan Drake took a lateral in the final play of the game all the way to the house with no time left to beat New England. 34-33, we can now view it in all of its 8-bit glory. For those of you that missed the insane finish to Sunday's game on television, it's just as graceful in real-time action as it is via digital recreation. Trailing 33-28 from the 31-yard-line with just seven seconds remaining in a back-and-forth battle with the Patriots, Dolphins QB Ryan Tannehill tossed a pass to Kenny Stills, who lateraled it to WR DeVante Parker, who then lateraled it to RB Kenyan Drake. Drake proceeded to take the rock all the way home for the win with no time remaining. And just like the real thing, Gronk totally whiffed in Tecmo too. Perhaps, the best part about this crossover to 8-bit replay is the fact that so many of the players on the field making the play – most importantly, neither Drake, Parker nor Stills – weren't even born when the Tecmo Super Bowl game was released in 1991. But now, they're part of it's iconic lore.